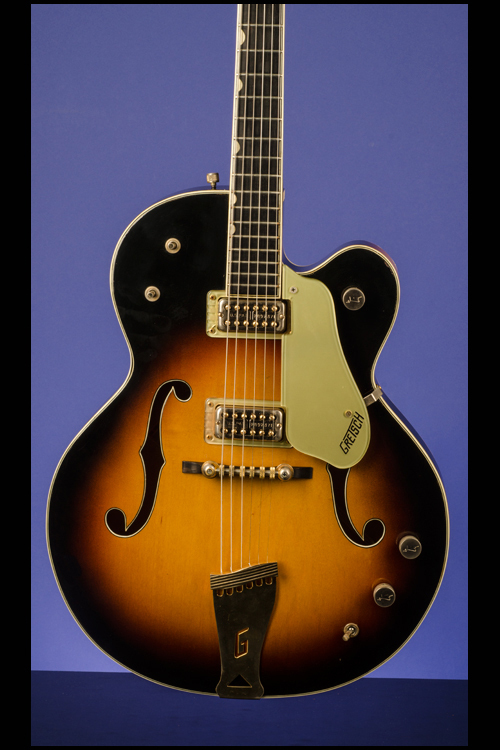 PX-6192 Country Club Guitars | Fretted Americana Inc.
A 1964 Two-tone Sunburst, Thick Bodied "Country Club"
1964 Gretsch PX-6192 Country Club. This 17-inch-wide and 2 3/4 inch-thick Country Club weighs just 8.00 lbs. Laminated rock maple body with laminated maple top and two large white and black bound f-holes. Two-piece rock maple neck with an ebony center strip, a nice fat nut width of 1 3/4 inches a scale length of 25 1/2 inches and a medium profile. The body of the guitar is triple-bound white over black on the top and back. 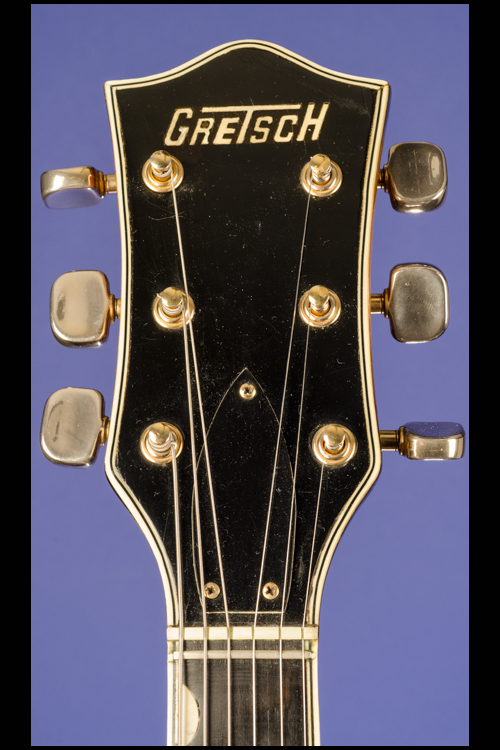 Triple-bound headstock with inlaid pearl Gretsch "T-roof" logo. Two-layer black over white plastic 'bullet' shaped truss-rod cover with three screws. 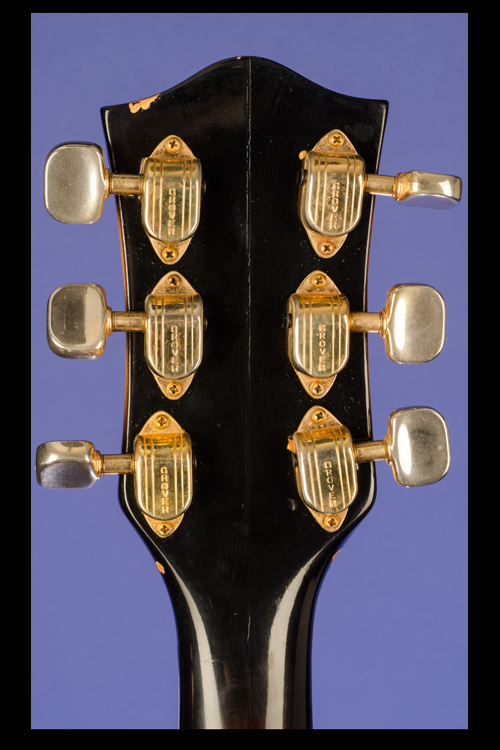 Individual Grover Imperial tuners with 'kidney' shaped metal buttons. Single bound ebony fretboard with 'zero' fret and 21 original thin frets and 'neo-classic' inlaid pearl thumbprint (half-moon) position markers. The fretboard has a single white line inlaid on each side and at the end. 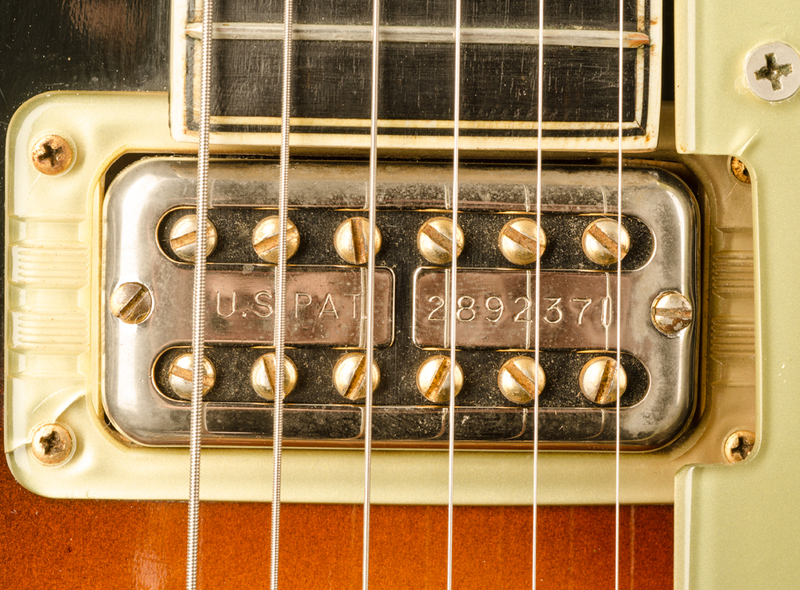 Two Gretsch "Patent Number" Filter'Tron Humbuckers (with "U.S. PAT. 2892371" stamped on the face of the pickup) with gold Lucite ridged surrounds and outputs of 4.80k and 4.74k. 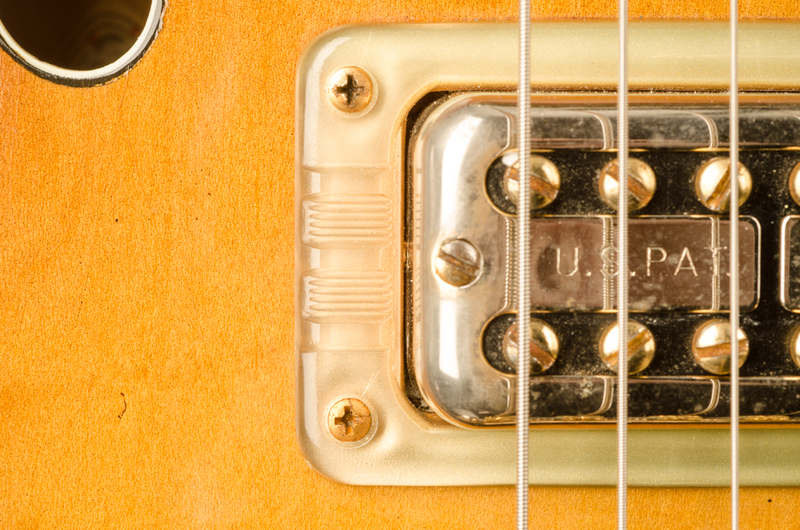 Each pickup has two adjustable polepieces for each string. 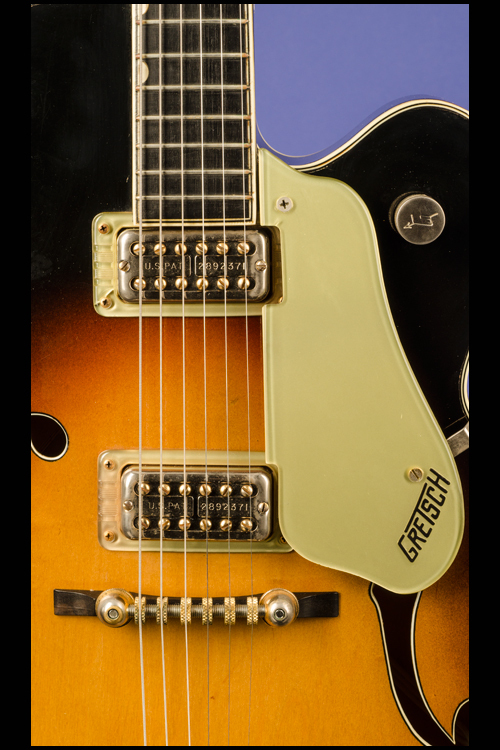 Gold Lucite pickguard with Gretsch "T-roof" logo in relief in black, engraved from the underside. 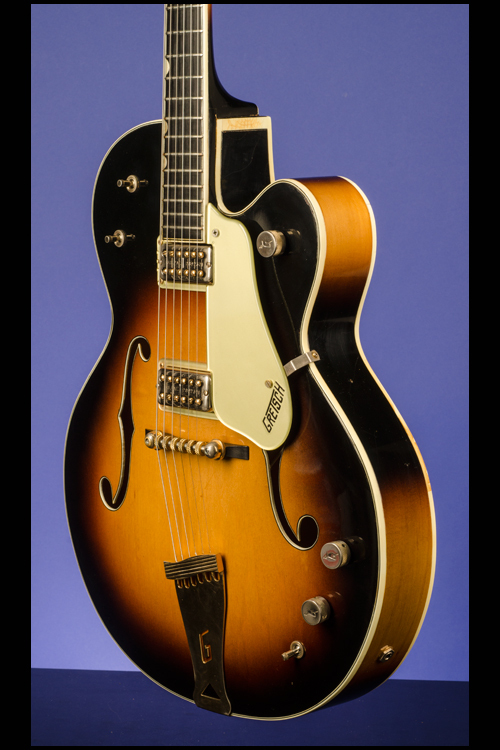 Two controls (one volume for each pickup), a three-way standby switch, a master volume control on the cutaway bout, plus one three-way pickup selector switch, one three-way tone selector switch on the upper bass bout and a three-way 'standby' switch below the two individual volume controls. "Arrow-through-G" knobs with cross-hatch pattern on sides. 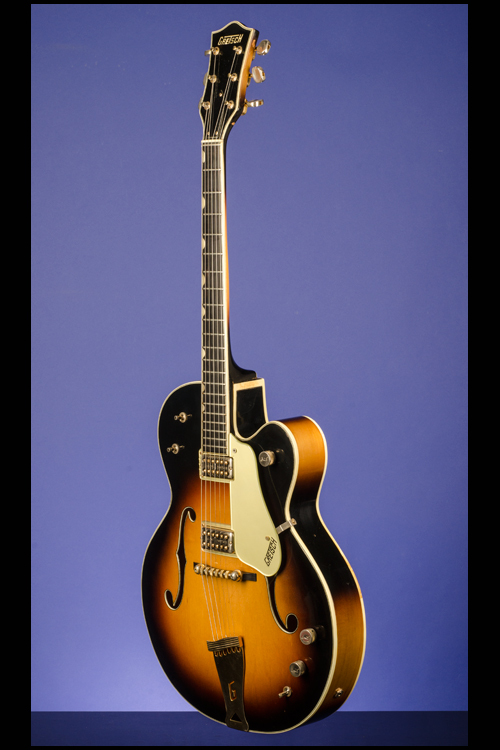 Gretsch 'Roller' bridge on height-adjustable ebony base and "G" cutout" flat tailpiece secured to the edge of the body by three screws. All hardware gold-plated. Rectangular orange and gray label inside bass f-hole with the model number "6196" written in blue ink and the serial number "78428" typed in black. 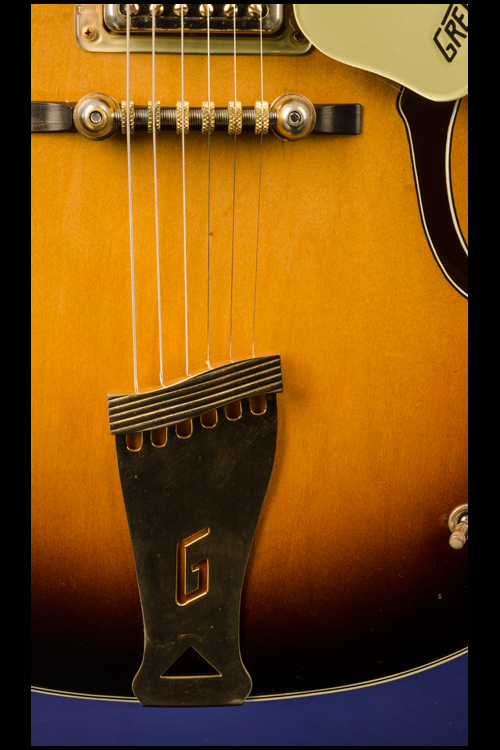 On the top of the guitar at the bass waist and the back of the guitar at the treble waist, the triple binding is separating just very slightly by one sixteenth of an inch. 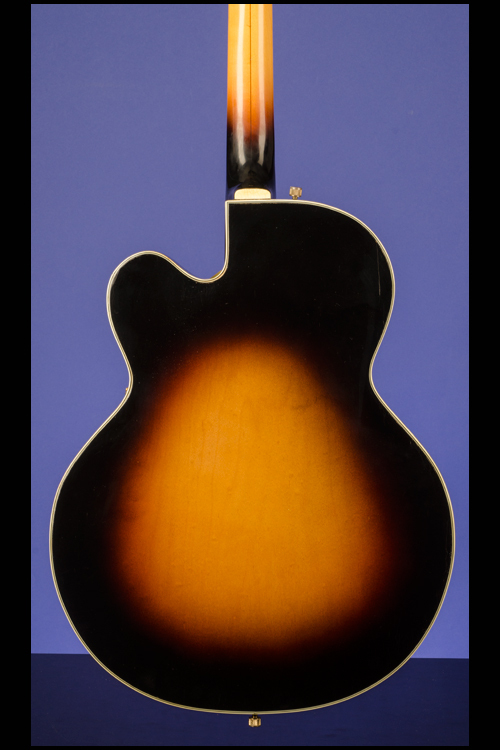 There is some light discoloration to the binding on the neck heel and also by the treble-side neck joint. 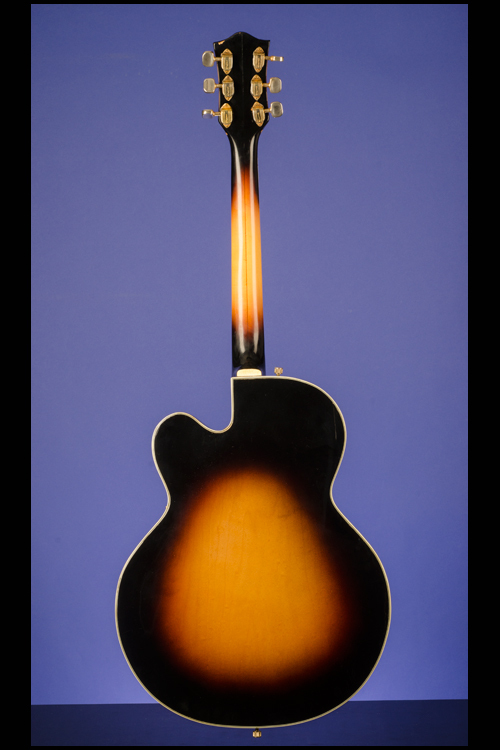 There is a very small area of overspray on the treble side of the guitar between the jack input and the tailpiece bracket. There is no evidence of any cracking or damage and this can only be seen under an ultra violet light. We assume that this 'overspray' covers a small mark or scratch. 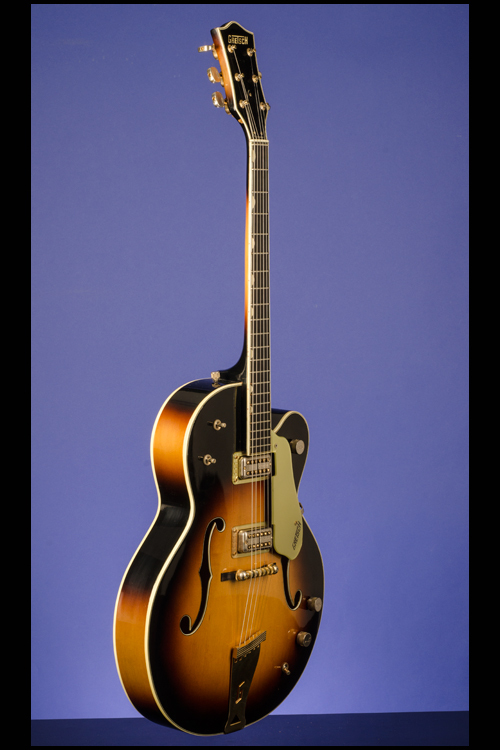 This fifty-year old beauty sounds and plays just like it should - a really nice exceptionally fine (9.00) example. 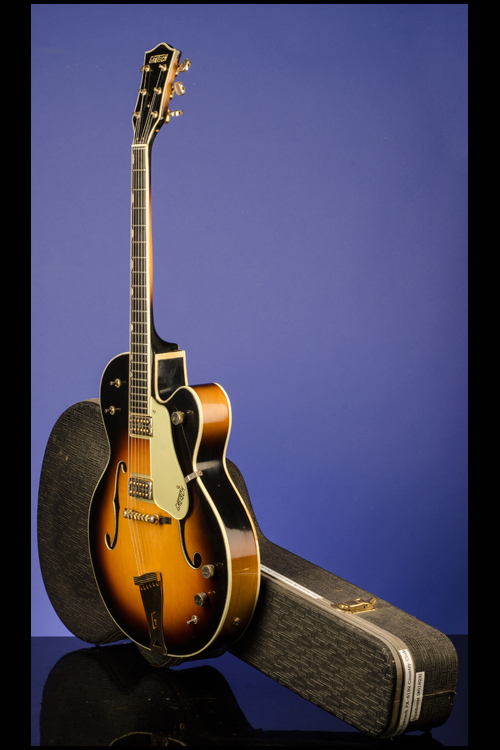 Housed in the original Gretsch five-latch two-tone gray shaped hardshell case with maroon plush lining (9.00). "All 1963 Country Club models bear precisely the same characteristics as their 1962 counterparts. 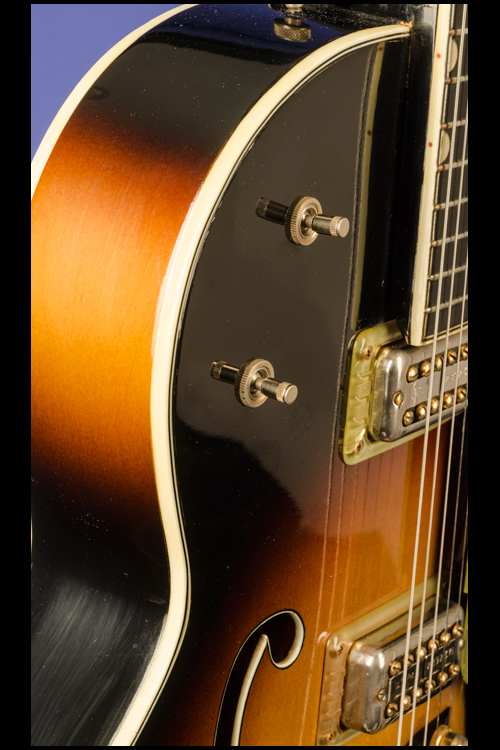 In 1964 "kidney button" Grover tuners replace the Imperials; the padded back is taken off the model; the single muffler is removed; the standby switch remains in the circuitry and will persist into the Baldwin era. 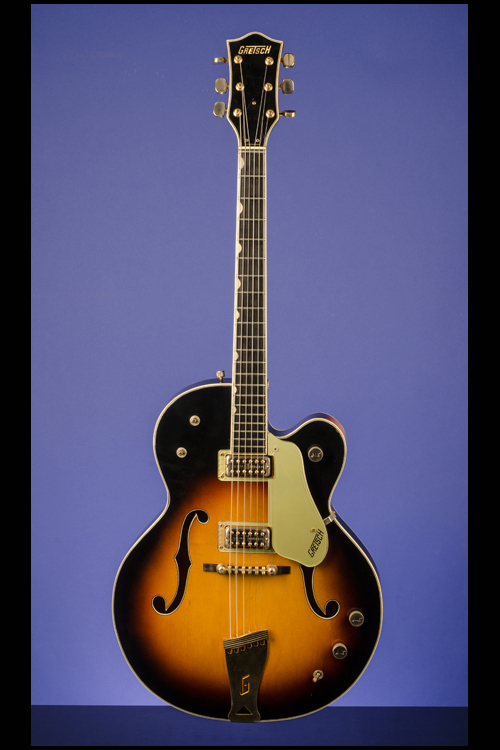 This year the shallow 1 7/8-inch body begins to give way to a resurgence of the full depth, 2 3/4-inch-thick guitar and by 1965 all Country Clubs utilize the deeper body. 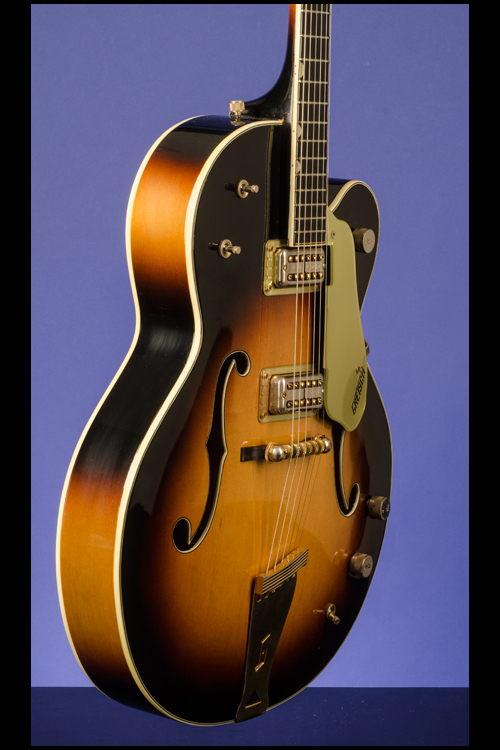 In short, by mid-decade the model has reverted to the straight ahead, unaffected jazz standard it was intended to be." Jay Scott. 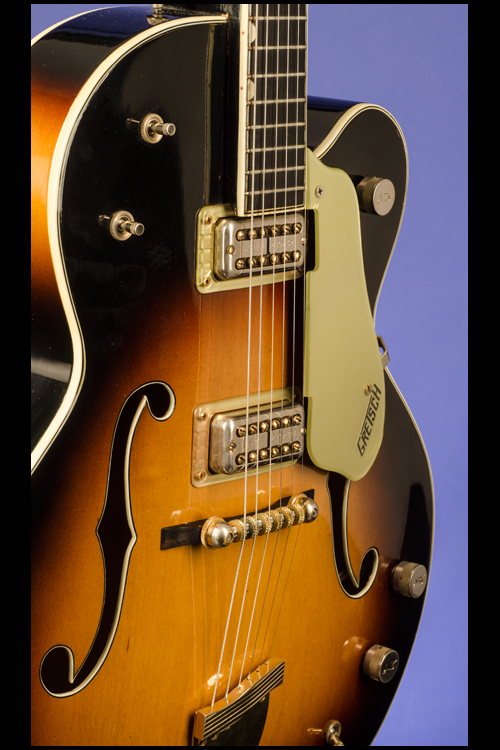 (The Guitars of the Fred Gretsch Company. p. 55).